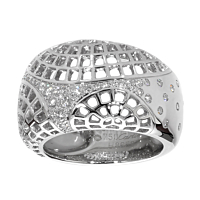 This authentic Cartier diamond ring in 18k white gold is set with the finest Cartier round brilliant cut pave diamonds. This Cartier diamond gold ring is set with .65 carats of pave diamonds, and a large part of the gold is covered in a delicate curved latticework effect. Exceptionally rare!